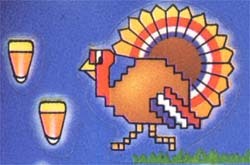 It's like Intellivision, but with turkeys. Its rare enough anymore to find a store thats stayed in the same spot for decades, but a store where even the merchandise appears to have barely budged -- now, thats something special! Theres a time-warpy place like that a few blocks from my house, where I found these stickers under a layer of dust. The copyright date says 1984, and Im inclined to believe theyve been sitting on the shelf since that year. 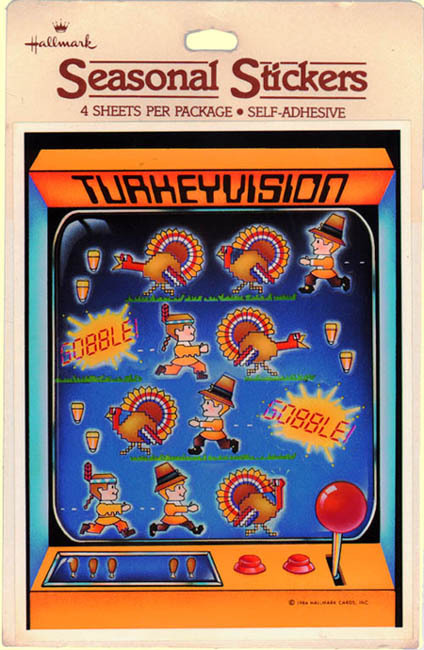 And what fine stickers they are: Turkeyvision! Makes you kinda wish Hallmark went into designing video games for real, doesnt it? Great presentation, with a video game console border which is also a sticker. (I put one on a picture frame where I proudly display portraits of the turkeys in my life). Glare on the screen and everything. Im having a bit of trouble with the game though. Which one am I supposed to be? The turkey? 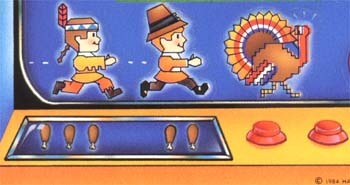 The pilgrim? The white kid dressed like an Indian? And isnt candy corn more of a Halloween thing?